I have aimed at renewing some of my classroom practices with the help of social media to create authentic foreign language situations for my students, instead of the traditional learning in a void with a course book and only other speakers of your native language. I have believed that communicating in an online network/community with young people from many countries, as part of your course performance, would excite and motivate students. This week I was proved wrong, however. Due to the lack of funds to pay for subsitute teachers, while attending a conference last week, I activated my students online. An extra bonus for them was that they didn't even have to go to school for the first two morning classes, but could 'take' their English lesson at home. They all registered as members on our international project Ning, and I posted 2 prompts with links to texts and videos plus discussion questions for them to reply. Naturally, I also hoped that some of the foreign project members would participate to make it the authentic situation I had in mind. Today I met the group for the first time since last week. Only 10 out of 21 had written a reply on the Ning! Some pretended they hadn't understood what they were supposed to do, others simply shrugged and avoided my eyes. In other words, they had just taken the time off without doing any work at home! Another disappointment - none of the foreign members have taken up my challenge of joining us in these environmental discussions, at least not yet. That is the trouble with asynchronous communication - our fast-paced 6-7-week grading periods don't allow for hanging around waiting! What's more, I only realised in hindsight that building a conversation online doesn't come naturally to my students. I should have provided them with clear guidelines and expected outcomes for this exercise. Next time I do anything like this I will prepare an assessment rubric together with the students, so there won't be any uncertainty about the expectations. Mind you, it wasn't a total failure. I am just feeling rather pessimistic at the moment for some reason.Even without a rubric, some students did still do quite well, and managed to express themselves clearly and interestingly in English. It was the indifferent slackers and those who wrote very short and superficial comments, mainly just repeating what somebody else had already written, that really frustrated me. For them, it was nothing but another boring teacher-assigned homework exercise they weren't in the least interested in. I should probably blame myself for once again giving them schooly, unmotivating assignments. What should a task be like to make them want to do more than merely go through the motions to avoid the nagging of the teacher? The next complaint came when I started showing them where to type their blog post that is due next week. Some of them started asking if they could just do it as a traditional handwritten paper assignment instead, and bring it to me in class. When I inquired about this preference they said that they didn't want anybody else to see what they wrote and maybe laugh at them! Fair point, although I tried to convince them that surely all of them were mature enough not to laugh at other people's writing. At first all this made me quite angry, then discouraged. I feel as though all my efforts are futile. My attemps of practising what I preach, ie. being myself a model of a lifelong learner with a semi-active online presence, is making no difference to them. They probably need peers as models, and not a nutty middle-aged teacher. I'm beginning to lean again towards only offering online work as an option to those students who feel comfortable, competent and at ease with such environment, and are possibly drawn to the chance of interaction with international students. In this old blog post I felt like that very strongly last year, but then changed my mind after reading about many inspirational examples from around the world of how students enjoyed being active online participants (for example this one). Then I started thinking that maybe it's a question of national mentality. Stereotypically (but with a lot of truth in it, too!) Finns are notorious for needing a lot of personal space, wanting to blend in and not stand out, keeping very private about their thoughts, and generally refusing to step outside their comfort zones. All this is emphasized manyfold when it comes to active foreign language use, despite all the efforts of modern language teaching focusing on communicative skills in addition to the traditional translations, grammar and deadly gap fills. 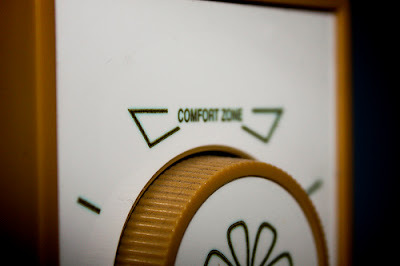 I would like to push my students' beyond their comfort zones at times, because you simply have to if you are to actively engage in communication in a foreign language. The undeniable fact is that many Finns still come across as painfully awkward when speaking English or other foreign languages. They will politely give perfunctory answers when asked, but who would want to continuously keep asking if there is little input from their conversation partner? This is one of the lessons Finns find extremely hard to learn. What's more, it's glaringly obvious that they have no chance of developing these skills if all they do in language classes is read ready-made questions printed in the book or a worksheet prepared by the teacher. It's all just one-way and no real discussions are built. Question-answer-question-answer, perfunctorily do what the teacher tells you to do, but no more. The sooner you are finished the sooner you can sink back into your own private world and just sit there quietly or start leafing your diary, texting friends on your mobile phone or gossiping in Finnish. Regular scenario I encounter in class every day. Exactly the same pattern was repeated by some of my students in the online discussion. How to activate them? How to come up with meaningful activities for them, and most of all, how to help them develop and get the point? With Finnish students another important learning experience would be to be positively supportive and encouraging towards others - we tend to be rather judgmental, negative and critical. I wonder whether this is why some students feel reluctant to publish their work online. It will be interesting to see next week if most of them will now resort to the traditional paper version and not bother about the Ning blog? I didn't want to force them to publish anything against their will, so I left the choice of medium up to them. Now I rather regret not sticking to my convictions. I think I will bring it up again in tomorrow's class to try to discuss with them the educational purpose behind it all in more detail. Only, I am on rather shaky grounds banging on about authentic situations, when at the moment it's only my students discussing the topics anyway - they might as well do it amongst themselves in class. In my previous project, dialogue between students from different countries didn't work, because of scheduling problems and overall the considerably smaller number of participants. This time there are 255 members on the Ning, which is more than enough, and only a handful of students from the Philippines have started their summer holiday so far. But still, I fail to get this more in-depth dialogue started outside the chatty teen-topic discussion forum. Possibly it's a question of drastic differences in curricula and the students' English skills plus the lack of tighter pre-project planning with all the teachers. Improvising in international projects can produce beautiful, unexpected results, but also backfire - as now.